As much as we appreciate the hi-fi, glossy sound of some of the indie rock bands we often recommend here on SEA live MUSIC, we can’t resist the raw, untamed and rough edged sounds of one of the local scene’s up and comers, Fox and the Law. Fox and the Law play some of the best garage rock in the region today, giving a clear nod to Seattle’s famed grunge roots. Unpolished but perfectly in sync, the group is celebrating a brand new album, Scarlet Fever, which officially hits shelves on Aug. 18, and is already winning fans left and right. We bet once you hear their bluesy punk, you’ll be a fan, too. 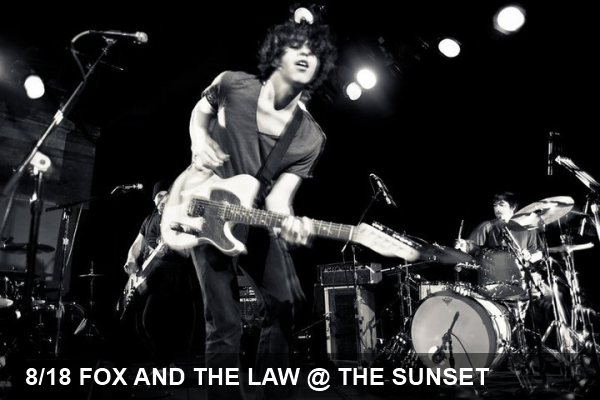 Fox and the Law are playing tomorrow night at the Sunset Tavern, following Strong Killings and Ben Union.